#1,631 Shop Apron. – Laurel Mercantile Co.
Now reading: #1,631 Shop Apron. Y’all! They finished building the shop before we left for St. Augustine, and they’ve been doing the odds and ends like paint, the ceiling, and today… The apron/driveway. There’s a brick basketweave pattern around the edge, then just regular old concrete in the middle. We might stain the brick to match the brick in our existing carport. I wish I’d remembered to take photos of my favorite little details—our hand and paw prints with initials, and a Laurel brick in each corner. Tomorrow I’ll post those. 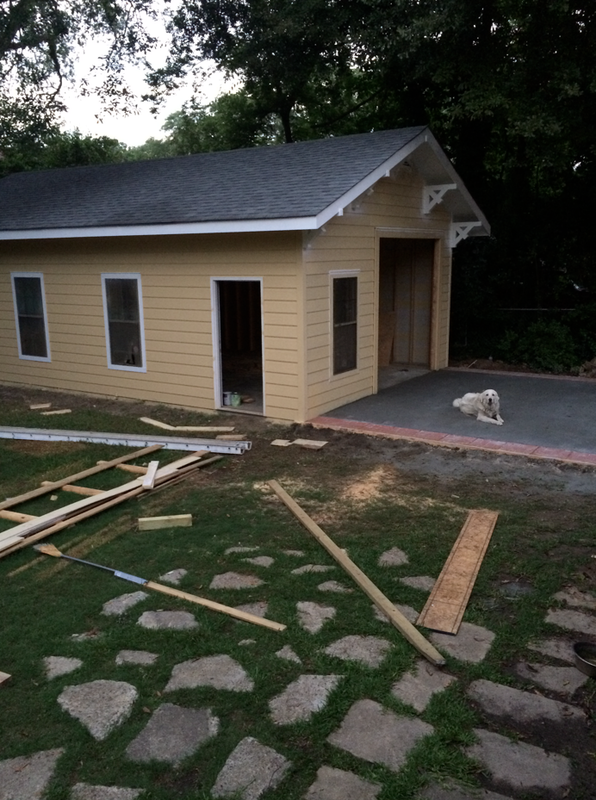 They’ll be finishing up the paint, building the garage door, and doing the electrical work soon. We’re almost finished, then on to tackling the nightmare that is our yard. You notice I haven’t been swinging the camera around that direction.